travelling between life and death | doberman pizza. When someone dies, a shrine is erected as a memorial, and decorated with flowers, candles and lights. A picture of the deceased is placed prominently in the centre, and a bowl for planting sticks of incense is placed in front of it. Family and friends gather to pay their respects, attend prayer gatherings, and comfort the immediate family and share their grief. Upon arriving, visitors burn an odd number of sticks of incense, and circumambulate the coffin—or the body, if the coffin isn’t yet ready. Everything has a set time for a Vietnamese funeral. Historically, the Vietnamese always depended on oracles and sages to read the stars and determine locations and times for every important event of their lives. The time the body is placed in the coffin, the location of the cemetery, the time the coffin is brought to the cemetery and placed in the ground—all are planned and optimized for maximum auspiciousness. While they wait for the auspicious moment, the family will hold an honour vigil around the body, staying up all night at its side, praying. To perform the traditional rites—which sometimes seem about as complicated as a wedding—families may hire a company to coordinate a “funeral package”. These packages take care of things like the coffin, decorations, transportation, mourners/pallbearers, monks, and even the infamous brass band, the one that wakes everyone up at 5:30 on the morning of the funeral procession. The procession is led by the band, who clear the way ahead, followed by the monks and male members of the family, who carry along the objects on the shrine, including the portrait of the deceased, the incense bowl, candles, and so on. As an aside, Vietnam is highly patriarchal—meaning that the duties of worship are usually borne by the men in the family. (This isn’t universal, however; Quynh told me that she carried her father’s portrait during his funeral procession.) 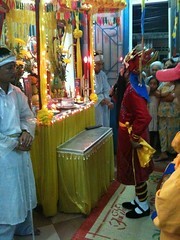 Afterwards, the coffin is carried out of the house, with the female members of the household following. Friends and neighbours follow along and accompany the family to the cemetery for the burial. 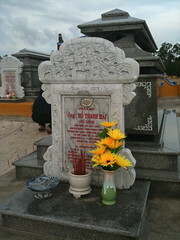 Soon after I arrived in Da Nang, we paid a visit to the cemetery where Ba was buried. It’s about twenty minutes south of town in Hoa Tien village, a truly beautiful place surrounded by forest. Covered in sheets of white sand, the family plot is surrounded by a half-metre-high orange wall, with a family shrine jutting out of a two-metre-high back wall. At the back, Quynh’s grandmother and grandfather rest in “tombs” on a slightly raised platform. These “tombs” themselves are actually not inhabited, and seem only to act as a cover for the grave—bodies are actually buried beneath, contrary to what I had thought before. On one end of the tombs is the Chinese character for “blessing” (probably the most ubiquitous character in the world, behind “double happiness”, the one used in weddings). On the other end is a tombstone, noting, well, tombstone information. In front of the tombstone is a small pot for incense. At the top of each tomb, there is a little alcove; things are stored there, like small oil lamps, sticks of incense for burning, and so on. There’s a shallow bed of sand in the alcove; in the one on Ba’s tomb, a Baha’i prayer book and a stone engraving of the Baha’i ringstone symbol are buried. In the post-funeral tumult, Quynh was able to tell me a little about some of the challenges the immediate family had integrating Baha’i beliefs into the Vietnamese funeral traditions. Because of the extended family’s great love and respect for her father, they were quite tolerant of the departures from tradition that he had asked for in his will, although there was the odd clash. He wanted a short, simple funeral according to Baha’i custom, but it was extended to three days to allow the extended family time to visit his body and pay their respects, the normal practice in Vietnamese custom. One anecdote that stuck in my mind was about the funeral procession, bringing the body from the family home to the cemetery south of Da Nang. In Vietnamese tradition, votive paper is scattered in the wake of the funeral procession, to give the newly deceased spirit a “path” to follow back home. Quynh’s father didn’t believe this was necessary, and told his children he would not want this done at his funeral—so the family didn’t scatter votive papers either coming or going. This prompted one extended family member to follow behind the hearse shouting loudly, asking frantically why the family wasn’t scattering the papers, to which Quynh shouted back that her father didn’t want it that way. We returned to the cemetery several times while I was in Da Nang, offering more incense, planting it in the white sand that surrounds the tombs, and generally keeping the plot clean. That’s for a future post, of course. There’s a lot I still don’t know about funeral customs, having never been present, for example, during the first few days of grieving when a body was prepared for burial, or during the burial itself. I sincerely hope I don’t have to learn for the time being—the family’s losses this year have been more than anyone would want to handle. In case you didn’t notice (or you’re reading this in a format that doesn’t display it), I’ve posted a video at the top of this post, called, for lack of a better title, “Vietnam: Travelling between life and death”. It contains footage of the funeral procession of Quynh’s neighbour in Da Nang, footage which her mother encouraged me to take to share with family back in Canada. So here I am, sharing it with you, along with some more general information about funeral customs in Vietnam. Click to watch it, or see it on Youtube. Next post: taking care of the shrine. This entry was posted in asia chronicles, baha'i blog, journal and tagged family, quynh, reflections, travel, video, vietnam by danger. Bookmark the permalink.